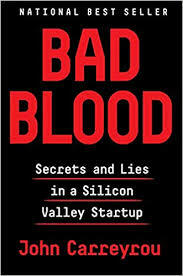 Bad Blood: Secrets and Lies in a Silicon Valley Startup by John Carreyrou is about the now shut down medical startup Theranos and the book an interesting look at gross mismanagement and deception, as well as the impact of the right people vouching for something. The company was run by Elizabeth Holmes, with her starting by getting a $1M investment from famed venture capitalist Tim Draper, the father of a childhood friend, and by the end of 2004 having raised nearly $6M. Holmes cultivated a network of esteemed advisers, with the Board of Directors including Henry Kissinger and George Schultz, current Secretary of Defense George Mattis, and venture capitalist Board Chairman Don Lucas. Many of the Board members were fellows at the Hoover Institute on the Stanford campus and Holmes managed to make herself a sort of granddaughter figure to some, even while she set up the Board so that she had all the voting rights and few checks on her decisions. Many of the Board members having a military background helped perpetuate the myth that Theranos used in the U.S. Armed Forces and a later-joining Board member was high-profile lawyer David Boies, whose firm would relentlessly attack anyone in the Theranos cross-hairs, often former employees that they wanted to ensure said nothing negative about the company. The main charge that Boies, Holmes, and Sunny Balwani, her boyfriend she brought into Theranos as an executive, fought against was that the technology didn't work. The Theranos offering was a device that would prick a drop of blood and and from that limited amount, run tests that otherwise would have to be done via much larger needles. However, what they purported to be able to do had been attempted many times and it was simply impossible to have so many different blood tests run from a tiny amount of blood. The result of this was test results from Theranos were often inaccurate and this type of hyperbole around capabilities not unheard of from a startup, but with it involving medicine, the stakes definitely were raised and there potential for people being either over-treated or under-treated as a result of the tests. Additionally, Holmes and Balwani created a horrific work culture, with constant firings and fear throughout the organization as well as groups working in silos and not knowing what was going on in areas that impacted them. The two of them would coordinate the deceiving of potential customers and partners when doing demonstrations of their technology, helping lead to Theranos being in some forty Walgreens locations in Arizona and at its highest point, the company was valued at over $9B, putting Holmes' net worth on paper at some $4.5B. Things started to come undone when a doctor who wrote a medical blog was contacted about the company behaving wrongly, and he then reached out to Carreyrou at the Wall Street Journal who began to investigate. This led to Carreyrou contacting, along with other former employees, Tyler Schultz, the grandson of Board Member George Schultz, who sided with Holmes and didn't believe his grandson's statements about wrongdoing. While the company was being researched by the WSJ, it received $125M in funding from Rupert Murdoch, and Holmes attempted to get him to put a stop to the story in the works from the Murdoch-owned paper. Murdoch demurred to intervene, and then after the scandal hit, sold his shares back to Theranos for $1 to get the tax write-off to offset other earnings of his. The first article on the company by Carreyrou was published in late 2015 and by early 2017, the company's value $0 and Holmes and Balwani indicted on federal wire fraud charges in June 2018.